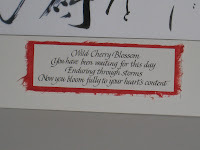 I've been doing calligraphy and custom artwork for over 30 years now and I'm always bewildered by timing. In the business of calligraphy it's feast or famine and discussing this topic with my peers know this to be true for them as well. In the past 3-4 months I've been extremely busy and have noticed that I've been asked by several friends to do custom work for them. I can't remember when I've been asked by a friend to do custom work and now all of a sudden 3 friends are needing something special. I'm extremely flattered and honored to be chosen and to know that they trust and respect my work. Out of the three, so far I've finished 2 custom pieces. 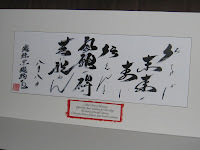 One of the pieces was to prepare a scarf that was created in Japanese calligraphy for framing and on the mat do the translation in English calligraphy. This was a challenge as the scarf was over sized and hard to deal with in terms of cutting a mat, framing the scarf and then doing the calligraphy on the mat. I was working on a budget and couldn't really out source anything. Years ago I would have taken on this project and approached it as a delightful challenge. Today, having RA and a somewhat limited use of my hands, saw this as more than what I thought I could handle. I kept trying to cut a mat and destroying it as my hands no longer have the strength to handle this task. Letting some time go by, I got in touch with my friend and discussed the situation and came up with a solution th at was agreeable with her. A simple thing really...I took the scarf and reduced it to a manageable size and then proceeded as originally planned. The only thing that is much different is that it isn't the original scarf which was the compromise. In the end she was delighted with her custom piece and I satisfied my desire to please my very good friend. Accomplishing goals via "The Secret"